Sony announced today that its Reader e-book will support the EPUB and Adobe PDF/A formats with the device's next firmware upgrade. 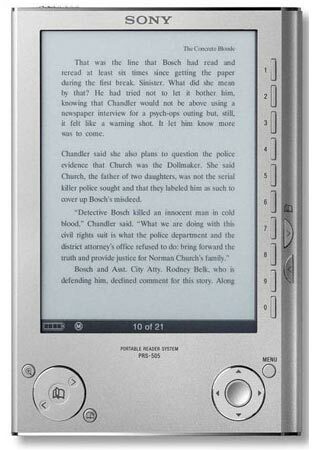 The PRS-505 (or Reader) currently has a selection of about 40,000 titles available from Sony's eBook Store. But next month, new models and those with upgraded firmware will be able to load IDPF/EPUB, and PDF/A files. The device previously supported BBeB (Marlin) Books, PDF, TXT, RTF and Microsoft Word files (converted with Sony's CONNECT software). EPUB is the International Digital Publishing Forum's XML-based choice format for publishing e-books. Publishers supporting EPUB include Simon & Schuster, Penguin Group, HarperMedia, Hachette Book Group, HarperMedia and Harlequin Enterprises Ltd. Many free public domain and self-published EPUB books can be found on sites such as Feedbooks. EPUB has lately been favored for its support for advanced features such as stylesheets, embedded fonts, and "real" tables of contents. PDF/A is a subset of the Portable Document Format that was designed for the purposes of long-term archival, with all fonts and images embedded into the document. They are made to be self-contained, unfettered, device agnostic, metatagged files. The additional format support should help Sony in its competition with Amazon's Kindle e-book reader. Amazon's device has curried favor with many consumers because of its built-in EV-DO, which allows the user to download content directly to their device, both e-books and audiobooks. Sony's Reader, while a bit cheaper and further along in its lifespan, requires the extra step of downloading content to a PC (Windows only) before it can be loaded onto the device.